As Zach and I prepare to move, I keep coming to the realization that I have an insane amount of work to do. If there is one thing I hate in this world (besides my piece of crap electric stove), it’s packing and moving…oh and unpacking. I hate that too. Since we are about a month away from the big day, I thought I’d get a head start on things. I’m actually making pretty good progress (which is awesome), but then I got to the kitchen; and I seriously wanted to cry. I’ve made it my personal goal to clear everything out of my pantry, fridge and freezer before we move (so that I can start fresh with my stock when we are all moved in at the new place). As I was digging through the bottomless pit that is my freezer, I came across, I’m not kidding you, 4 boxes of puff pastry. How I stocked up on 4 boxes is beyond my realm of thinking. The stuff isn’t cheap by any means! So, here is just the first of many recipes that will involve puff pastry in the next month. I stuffed these puff pastry pockets with everything that was on the verge of needing to be tossed: avocado, goat cheese, sausage and salsa. Puff pastry pockets are the absolute perfect appetizer for a quick dinner party/get together. Especially when you use pre-made puff pastry, this snack is one of the simplest you will make. You can stuff them with just about anything and everything. They can be sweet, savory or sweet AND savory! So get creative and get cooking! Description: If you haven’t yet noticed, I really like pale ales with avocado. It’s one of my number 1 go-to pairings. There are a lot of robust flavors going on in this pocket with the tanginess of the goat cheese, the smoothness of the avocado and the spiciness of the salsa, so I felt that a mildly hopped brew would go perfectly. This pale ale was the perfect pairing. It is crisp and citrusy, while still having slight malty notes. With so many bold flavors going on inside this delicate appetizer, Silverback is the perfect way to complete the dish. These puff pastry pockets are perfect for a get together. 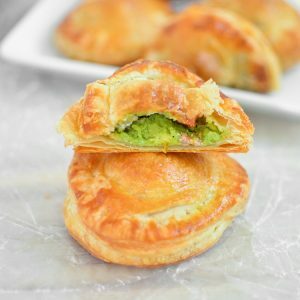 They are filled with avocado, goat cheese, sausage and more! Preheat your oven to 400 degrees F and line a baking sheet with a silicone mat or parchment paper. Set aside. In a large skillet, heat the oil over medium heat. Add the sausage and cook until browned and cooked through. Remove from heat and transfer to a paper towel-lined plate to get rid of any excess grease. Dust a large work surface with all-purpose flour. With a floured rolling pin, roll out the puff pastry as thinly as possible. If it breaks at any time, just piece back together with a little bit of water. Using a 2 - 3 inch round cookie cutter, cut out 12 circles (or as many circles you can get, making sure you cut out an even number). Place 6 of the puff pastry circles onto the prepared baking sheets. Dollop about a tablespoon of avocado in the very center of each disc (leave about an inch around the edges). Top the avocado with the goat cheese, then sausage, then salsa (dividing the ingredients among the 6 discs). Sprinkle each one with a dash of salt and pepper. Taking your finger, dab a little bit of water on edges of each prepared puff pastry disc. Take your remaining 6 cut-outs, and lay them on top of the mixture. Stretch them over the mixture, and seal the edges to form a pocket. Using a fork, crimp the edges to ensure they are tightly sealed. Brush each pocket with the egg wash.
Bake the pockets at 400 degrees F for 12-15 minutes or until the pockets are puffed up and brown. Remove from oven and let sit for 4-5 minutes. Serve warm with the remaining salsa on the side. Pingback: Fruta de temporada: 25 recetas para disfrutar del aguacate - Craft+Co.